Beleaguered King Gyanendra today offered to give up executive power and asked the seven-party alliance spearheading the pro-democracy movement to name a Prime Minister, but the parties were not enthused by his offer. India today welcomed King Gyanendra's move to transfer executive power to a government constituted by the seven-party alliance which has been at the vanguard of the pro-democracy movement in the Himalayan Kingdom. Do you think MS Dhoni is the best wicket-keeper batsman India ever had? Asserting that the civil services has to reorient itself and be trained to deliver better services to the people, Prime Minister Manmohan Singh today put several posers before the country’s civil servants, including whether the present method of recruitment was appropriate for inducting the right persons into government. Sleeping bureaucracy! 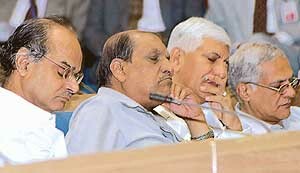 — Secrateries taking a nap during Prime Minister Manmohan Singh’s speech during the Civil Service Day function at Vigyan Bhavan in New Delhi on Friday. Assistant Sub-inspector Nanak Chand’s family was not very hopeful till this morning about the nation recognising his sacrifice in the attack on Parliament on December 13, 2001. Fighting red tape for the past five year, when the Union Government promised to give the martyr’s family a petrol pump that it said would be up and running in four months, the family out of frustration today approached the All India Anti Terrorist Front (AIATF). In a major relief for farmers of the region, the Prime Minister, Dr Manmohan Singh, tonight ordered a hike of Rs 50 in the minimum support price of wheat. Wheat will now be procured at Rs 700 per quintal. To make the government more efficient, we need a new public service orientation in the thinking of civil servants. You cannot view yourself as mere administrators. You are also managers. You have to manage change and manage efficient delivery of public services. Historical papers providing vital information about the efforts of Mohammad Ali Jinnah and his associates for the creation of Pakistan will now be available at the National Documentation Centre that has acquired the “missing documents” from a Karachi-based family. India’s first overseas military facility in Tajikistan is expected to become operational by the year-end as part of New Delhi’s thrust into oil-rich Central Asia to meet its growing energy needs. The Indian Air Force (IAF) is to deploy a fleet of MiG-29 fighter-bombers at the airbase at Aini, 15 km from the Tajikistan capital Dushanbe.